Growing up being legally blind with Aniridia was an immense challenge. Aniridia is the lack of an iris and the underdevelopment of the eye. In my case, it also comes with glaucoma, cataracts, microcornea, and nystagmus. I struggled with insecurity, lack of confidence, loneliness, and a general sense of un-belonging. Though surrounded with other family members who were also blind or visually impaired, I felt disjointed from the rest of my peers. As a result, I was never able to fit in despite all my efforts. 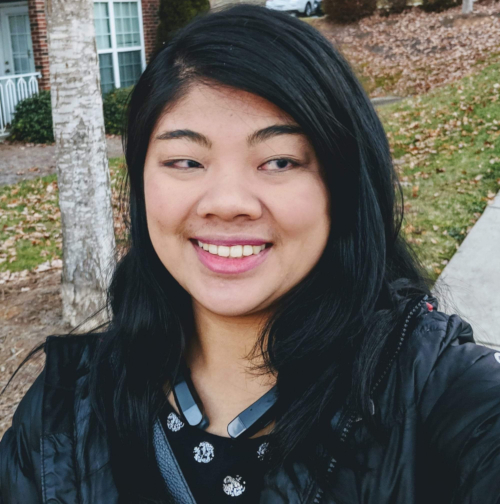 I struggled and concealed my depression and hurt with rejection, when people avoided or gossiped about me, and asked things such as “why do your eyes move like that?” or “what’s wrong with her?” Because of microcornea, my eyes appear smaller and nystagmus causes my eyes to constantly and uncontrollably move around. My defense was to emotionally detach. I was shy and became shyer and there would be days that I didn’t speak to anyone unless forced to by a teacher. What brought me out into the proverbial light was the help and support I found through community. My TVI (teacher for the visually impaired) told my parents about a summer camp for the blind. That camp literally changed my life as I thought I was alone, the only one struggling, but I wasn’t. It was through that program and others, I met fellow peers who shared my struggles. Attending these programs while in high school and transitioning to college taught me so many things. I learned independence, life skills, assistive technology, social skills, and leadership. What’s more, I saw other people who were blind and visually impaired being successful. I met and interacted with those who were living their dreams and striving toward their goals. This is what I wanted to do; to be like them, to have confidence and show that I was able. To reach past what society said I could and could not do and surpass even my own expectations. As a teenager, I stumbled and fell, was reckless, and made bad decisions. But life continued and led me to eventually move with my family to North Carolina. It was here I took a job at a company that hired many blind people. Starting out in manufacturing, I was promoted to being a receptionist. Eventually, I began working at the low vision center that was part of the company. NC is quite different from New Jersey which is where I mostly grew up. In the northeast, people generally mind their own business and didn’t speak to strangers. Well, North Carolina is the opposite. People would ask how I was, about my life, what I liked to do —all in the first interaction! Oh my, it was such a culture shock, to say the least. Yet, it pried me out of my shell and changed me. I went from being anti-social to not being able to stop talking. Over time, I gained more confidence and learned how to present myself. and met countless people with differing amounts of vision and needs. Along the way, I met my then to be husband, Pablo; we moved in together, got married, had a son. Due to the high costs of childcare and transportation, I decided to stay home with our son. Becoming a stay at home mom allows me the opportunity to invest in him completely as my father did for me. With Little Pablo being the first child, it was so exciting learning and enjoying him. This new life, a whole bundle of potential is everything to us. We found out that he has aniridia like me. Though it hurts because we all want the best for our children, he’ll be okay. I know that he will grow up with all the resources and support he will need. As life went on I grew accustomed to the new way of life with a little one. Settling into my routine, I began to have more time. It was in a moment of looking for something to do besides the day-to-day tasks, I had an idea. I decided to start an organization to share what my husband and I have learned and give others encouragement. Afterall, we all have it within us to continue, to move forward, and to reach for our goals. I grew up visually impaired, but my husband, Pablo, went from fully sighted to totally blind. None of us have the same exact stories. We have our own journeys, but we still face similar struggles and we can support and help each other. I began my youtube channel (Live Accessible) and website (http://liveaccessible.com) on November 1, 2018 and am amazed at the growth we have had. Our mission through our YT channel and website is to share hope, encouragement, community, resources, tips, and technology to help others who are blind, visually impaired, and sighted supporters. Along the way, I’ve made many friendships, met so many amazing people, and have learned so much from my viewers. I’m grateful for the opportunity to give back to this community. Together, we can make this world into a better place where we can tear down invisible barriers in society and in this world through raising awareness, mutual support, technology, and creativity. We can all live accessible. Outdoor selfie of Carrie Morales smiling. Carrie’s long black hair frames her pretty face. She is wearing a black leather jacket and a black top embellished with silver accents on the neckline. An outdoor selfie of Carrie and Little Pablo. Carrie is holding Little Pablo with her right arm and she’s wearing a blue long-sleeved sweater. Little Pablo is wearing a red fleece jacket. Big Pablo & Carrie share a sweet embrace. They are standing outside and sunbeams are illuminating Carrie’s hair. Big Pablo is standing on a lawn holding Little Pablo in his arms with his white cane tucked under his right arm. Both are casually dressed and wearing sneakers. Little Pablo has on a red puffer jacket and his dad has on a navy blue jacket. Today’s Woman On The Move, Kimberley (Kym) Dekeyrel, was recently featured as a cover model on the March edition of CAPTIVATING! An edited version of the following article also appeared in the magazine however we have some exciting news to share! It’s amazing what this woman has achieved in two years after a major lifestyle change. I want to show visually impaired people they can do anything. At the same time I’m showing my children there are no excuses not to be your best. At 37 I am the blindest I’ve ever been, yet I feel more unstoppable now than ever. My story of vision loss began before I can even remember. My parents received my diagnosis of retinitis pigmentosa (RP) when I was five years old. I can only imagine their devastation when they were told their bright blue-eyed daughter would most likely be totally blind by the age of 18. Without hesitation, they began to prepare me for life and I started learning braille and taking mobility lessons weekly. I learned cane travel and carried around ridiculously large print books all throughout school. Yes, I was made fun of. No, it wasn’t easy being the kid with the weird orange glasses that couldn’t go out for P.E. But my parents placed me in dance lessons and it became everything to me. I was a natural performer and never felt like the blind kid when I was in the spotlight. Even though I was the poster child for RP, I was an anomaly to doctors. My vision loss didn’t progress like typical retinitis pigmentosa. I lost my central vision first and was left with scattered islands of peripheral vision. Because of this, I honestly never felt like I was understood by other visually impaired people. I wasn’t in denial of being blind, but when you mourn the loss of your vision your entire life it simply becomes a part of your day-to-day challenges. So my life carried on. I went to college and earned my degree in dance and kinesiology. After graduation, I went to massage school then later met my husband at my first job at a doctor’s office. It was about this time that life punched me in the gut with a diagnosis of lupus symptomatic of rheumatoid arthritis. The agony I suffered for three years made being blind seem like a walk in the park. By this time, I had one son named Cooper and knew I couldn’t live a life worth living if I could barely move. After doing research my husband put me on an extremely strict diet that saved my life. Within six months of changing my diet, I was back on a treadmill and ready to have our second son, Easton. I never returned to dancing but two years ago my husband brought me into a CrossFit gym, I was terrified. How could I do anything if I could not see anything? But by the end of my first class, I knew I had found my new passion. Now, I am trying to become an empowered representation of the visually impaired in the adaptive CrossFit world. I want to show visually impaired people they can do anything. At the same time I’m showing my children there are no excuses not to be your best. At 37 I am the blindest I’ve ever been, yet I feel more unstoppable now than ever in my life. Being blind is hard, but if you live by faith and not by sight anything is possible. @KymPossibleXoXo as she’s known on Instagram, found out last week that she qualified for the adaptive CrossFit games in July. Her Instagram exploded when @CrossFitGames shared one of her competition videos and get this, it’s been seen over 350K times! I can’t tell you how excited I was to receive a message from Kym with her news. She even said that while we “technically” haven’t met, she was so excited to share this with me. And of course, I was probably just as excited to hear it directly from her. The adaptive CrossFit games are held north of Toronto and Canada during the country‘s largest Functional Fitness/CrossFit Festival of the year. Over 1,000 athletes of all levels will participate but Kym is the first blind athlete to be invited as a part of the adaptive athlete division. 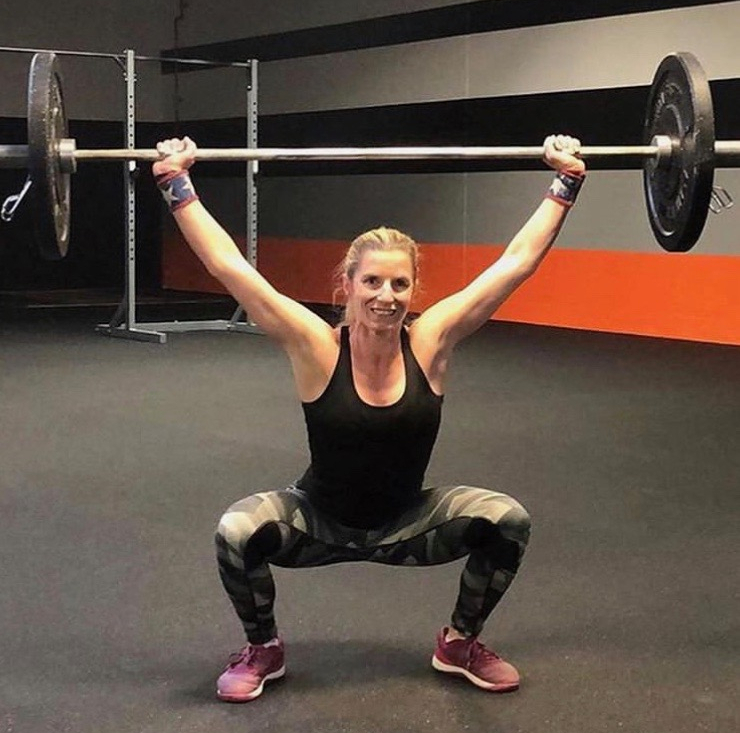 As having a visually impaired athlete in the competition for the first time, Kym is nervous and excited to educate the adaptive CrossFit community on how to best adapt movements for blind athletes. We are excited to stand by her all the way! We encourage anybody who would like to support or sponsor Kym through her journey to contact her. You can reach Kym directly via email at kymdekeyrel@gmail.com. Like her Instagram alias, Kym is showing us that anything is possible. In the featured photo, Kym is doing what she loves, working out in the gym. She is squatting while holding 90-pound barbells straight over her head. Her workout ensemble is a black tank top with gray and black leggings with geometric shapes and pink sneakers. Kym’s long blonde hair is in a ponytail. Kym, her husband and two sons, Cooper and Easton, are posing together as a family. Mom, wearing a black dress, and dad, in a blue polo shirt, is standing behind the boys. Kym and her hubby are standing together looking sharp. Date night perhaps? Kym is wearing a sleeveless plum colored dress with taupe dress shoes and her husband is in a suit. He is holding his jacket over his right arm. In this photo, Kym is in mid-shot of tossing a big ball against the wall at the gym. She’s in the same outfit as in the featured image. I was born with cone-rod dystrophy, but growing up, I didn’t know I was “blind.” Professionals said I had too much vision to be blind, I was “low vision.” That meant I didn’t have to learn braille or use a cane. My parents asked about braille lessons when I was about five, but professionals advised against it. They said I would try to look at the dots instead of feeling them. I remember thinking that sounded crazy since I couldn’t even see the dots on the page. But again, we were not the experts, so large print was the medium of choice. I didn’t have a teacher of blind students or an IEP (Individualized Education Program); terms I didn’t learn until I was an adult. Ocassionally, I received orientation and mobility lessons (O&M) with a heavy marshmallow tip folding cane that came up to my armpit. But why would I need to use that in my tiny K-12 school a place I knew inside out? So the cane stayed folded up and out of sight. The large print books were huge and heavy. Plus straining to read all day caused terrible headaches, so by high school, I almost completely stopped reading. Despite this, I graduated high school with OK grades and had a fairly normal adolescence. In college, I felt something needed to change if I wanted to live an independent, fulfilling life. The problem was I wasn’t sure how to accomplish this change. My Vocational Rehabilitation Counselor (VRC) helped me get a CCTV (closed circuit TV) to read with on my desktop. And even though I didn’t use it, I at least carried my folding cane. Since I couldn’t see in the dark I missed out on a lot of social activities. My fear was compounded because I was scared to travel to unfamiliar places by myself. I remember one evening in particular where I unexpectedly needed to stay on campus later than usual. This resulted in me not getting on the bus until twilight. When I arrived at my large apartment complex, I had trouble seeing the contrast of the buildings against the waning light. With only a bit of light left in the sky I had to count the rooflines to find my building. There were several stressful incidences like that, and looking back, I’m surprised I didn’t get hurt. But I wasn’t ‘blind,’ after all, I was ‘low vision.’ I felt like I was the only person in the world stuck somewhere between blind and sighted. Thankfully, I eventually found out how to make a change. After graduating from college, I got a new VRC, Matt Lyles, who was blind himself. He said if I really wanted a challenge, I should check out the Louisiana Center for the Blind (LCB). He described it as boot camp for the blind, and he would know since he went there himself. Matt told me the most important thing he learned at LCB was that our limitations have more to do with our own personalities than blindness. and in New Orleans at Mardi Gras. (https://www.nbpcb.org/nomc) to share the structured-discovery (http://www.pdrib.com/pages/canetravel.php) style of training with more blind people. Matt showed me the impact one blind person can make on another, and I hope to do likewise through my service. I’ve taught people of all ages cane travel and a positive philosophy about blindness through a variety of programs. Currently, I work for the National Federation of the Blind (NFB) of Texas as the NFB-NEWSLINE® Texas Coordinator. This position marries my undergraduate Journalism degree with my experience in the blindness field. NFB-NEWSLINE® is a free electronic newspaper and information service available to legally blind and print disabled subscribers. We also host training events for Texans of all ages across the state to teach people how to use NFB-NEWSLINE® and other blindness skills. Outside of work, I am involved with the NFB of Texas CAREER Mentoring program for blind youth. My husband Trae and I live with two cats, and a weenie dog. I enjoy traveling, hanging out with friends, and shopping. Recently, I’ve gotten into paper crafting and became a Stampin’ Up! demonstrator. Art, like most anything, is something blind people can do with the right tools and techniques. Not only would I have missed out on an amazing career and wonderful people without LCB, I would not have the tools and confidence I needed to be successful. I gained the skills to do small, everyday tasks like using a screen reader on a laptop and the confidence to understand that I am not inferior simply because of my blindness. I encourage everyone to find successful role models to serve as your mentors, and ask them what they did to develop the skills you appreciate in them. Blindness is not a tragedy, it’s just a characteristic. Liz smiles and is wearing a black scoop neck tee and sunglasses. 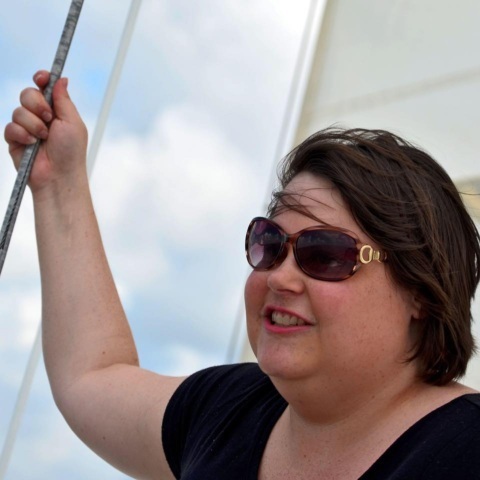 Her shoulder-length chocolate brown hair is blowing in the wind, as she sails with the Sailing Angels Foundation based in Houston. The sky and sail are visible in the background. VW Bug: Liz poses with a brightly psychedelic floral-print painted Volkswagen Bug car inside her favorite boutique, Beehive Outlet in Ruston, Louisiana. She wears a mint green tunic top with white lace side panels and front pocket, white leggings, and a long gold and pink floral necklace. Cannon: Liz stands beside a Civil War cannon at the Tupelo National Battlefield wearing a salt-and-pepper wrap top over a black lace camisole, black skinny pants, and black flats. Her cane is decorated for Halloween with purple spiderweb Duct Tape. Tower: Liz stands atop the 85-foot-tall Wilder Brigade Monument tower at the Chickamauga Chattanooga National Military Park. She wears a short-sleeved teal floral-print kimono cardigan over a white t-shirt, the sky, and treetops visible in the background. Her cane is decorated with sparkling silver material and a blue satin bow tied beneath the handle. Wedding: Liz walks down the aisle at her friend’s outdoor wedding wearing a lavender V-neck ankle-length dress with lace accents, her brown hair styled in an up-doo with curls. Her long cane is decorated with the same lavender material as the dress. Helen Keller: Liz recreates the iconic well pump pose at the Helen Keller Birthplace & Home in Tuscumbia, Alabama. She stands smiling at the camera with one hand under the pump’s spout and the other pulling the lever. Liz wears a black sweater dress trimmed with blue and white stripes around the hem, black tights, and a long matching black and blue necklace. RP (Retinitis Pigmentosa) was the diagnosis. I got into the car at the eye clinic and sat in silence with the devastating news I’d just received. It was a cold, blustery October day in 2008. I even remember how cloudy it was as the trees stood bare. We were parked directly in front of the window of the clinic. My eyes were fixed ahead on people sitting in the waiting room. “Am I going to go blind?” I asked my mom after what felt like hours. why I hated movie theaters. The list goes on and on. I was glad that it was all making sense, but at the same time, I wished I hadn’t found out. Up until age 15, I thought everyone saw the way I did. Why think anything else? I felt so ashamed and stupid that I was visually impaired. That somehow people would think it was an inconvenience or a hassle that I couldn’t see in the dark. For about 8 years I decided nothing was wrong with me. I ignored the diagnosis of RP and I refused to take my pills regularly or tell anyone about my vision. because I couldn’t see on the dance floor like everyone else, I’d leave, alone and in the dark. Why couldn’t I be like everyone else dancing so lighthearted. Going out became so taxing and so painful that I isolated myself my senior year of college. After I graduated college and moved back to Minneapolis something in me shifted. I was sick and tired of feeling sorry and bad for myself. So much hope I had placed in research and retina specialists. When they told me there was nothing I could do and that my vision was getting worse, I was crushed. I began looking up alternative ways to help heal vision loss. That’s when I found micro-acupuncture. For the past two years, I have been taking a more holistic approach in the way I manage my RP. I began eating a diet of anti-inflammatory foods, educating myself about how the systems in the body work together, and started going to micro-acupuncture. As I have been opening up to others about my vision and started to advocate for the modifications I need, I noticed a lack of awareness about vision loss and people who struggle with it. So many people are affected by loss of vision at some point in their lives, why is it not more well-known and talked about in society? One year ago, I quit my corporate job and decided to pursue my passion. On February 16th, 2019, I launched Watson & Wilma, a line of ethically made intimates. I designed each piece and enlisted the help of local pattern makers to bring it to life. Each item is made-to-order and sewn in Minneapolis from 70% sustainable and organic fabrics. Vision loss is an invisible disability but a major part of everyday, as intimates are a similarly hidden but important part of every outfit. A portion of each sale will be donated to the Penny George Foundation, to help provide holistic care and treatments to those with vision loss. My mission is to spread awareness about vision loss and for the visually impaired community. As expected, there are still hard days and days that I become discouraged about my vision, but my “why” keeps me going. I am doing my best to turn my pain into empowerment and allowing it to navigate my path instead of fear. A scenic outdoor shot of Hannah smiling while standing outside with a mountain range in the background. 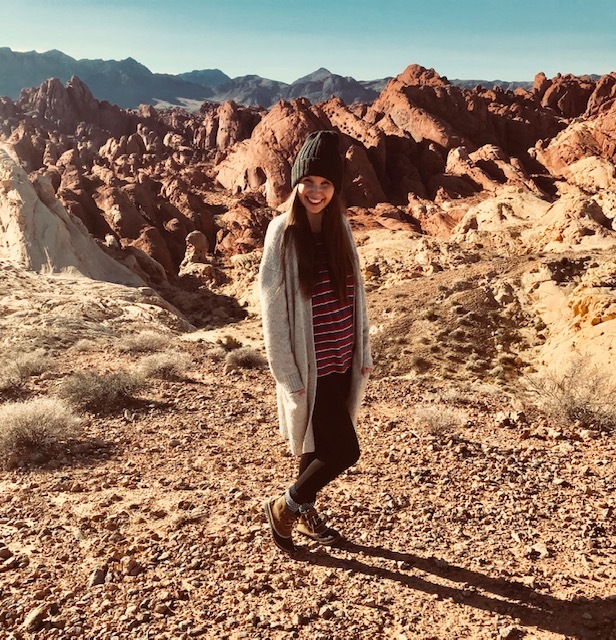 She is dressed casually in jeans, striped top, with hiking boots and a long warm-looking sweater. Hannah also has a black knitted hat on her head and her long brunette hair is draped over her outfit. Models: Two women (one brunette, one blonde) are wearing all of the pieces in Hannah’s current collection. The photo shows them hanging out in a living room. One of the models is sitting on a sofa while the other one is kneeling on the floor looking through music albums.